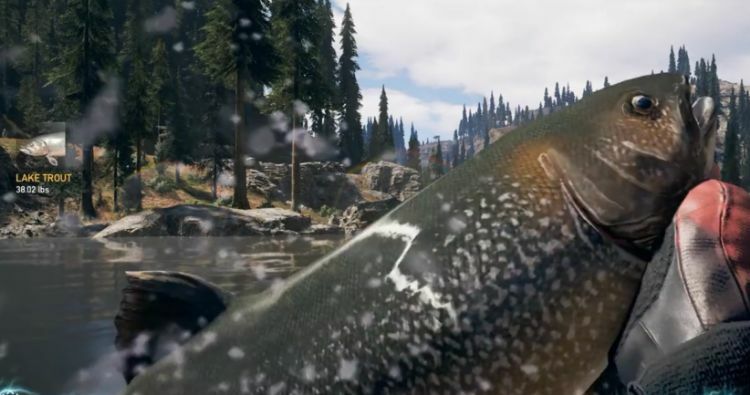 Far Cry 5's best fishing rod is of course "Old Betsy": a superior rod with the performance to catch those huge fish. To help you unlock this beauty, the guide below contains a complete list of all hard fishing locations and details explaining how to understand the regional fishing records and how to gear up for the big fish. 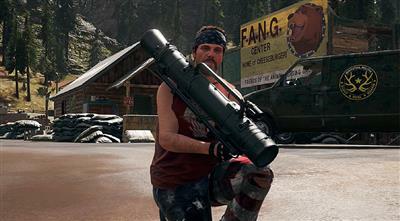 As you may have seen already, the Far Cry 5 shop contains a total of four fishing rods, three of which are unlockable. Upon visiting your first fishing spot, a basic rod is always yours for the keeping. This gives you a chance to test out the fishing controls and enjoy a spot of light relief from the gunfights. However, you'll soon notice the free versions drawbacks; such as weak line and handling; and will want to upgrade to the superior versions asap. Complete all three of these to unlock the Wonderboy rod. 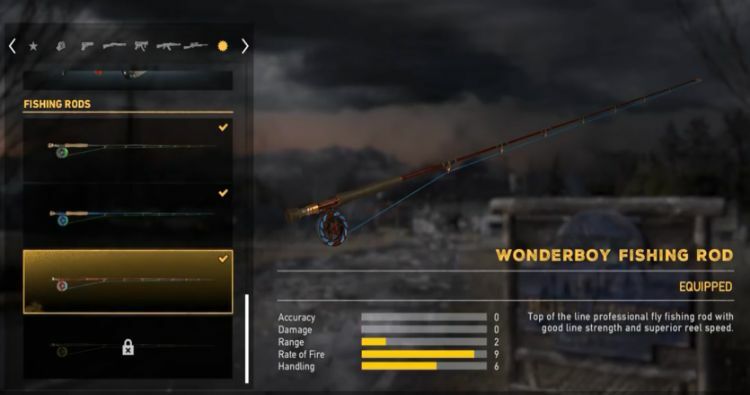 Now that you've unlocked the Wonderboy rod, you're ready to go after the best fishing rod in the game. The Old Betsy rod is unlocked by completing a challenge - "beat each regions state records by fishing at HARD spots across Hope County". At this point you might be wondering what the records are? How will you know what fish to catch and where to do it? Well, this is where you need to understand the leader boards. As you look at a particular board, note that the four fish on left are the same for each of the regions. The fish on the right are the region exclusive records, for just that region.. When you actually come round to beating the record you get a little pin beside the board with a 1st place icon. It's important to return to the board to see this as you won't receive an in-game notification for each record beaten. 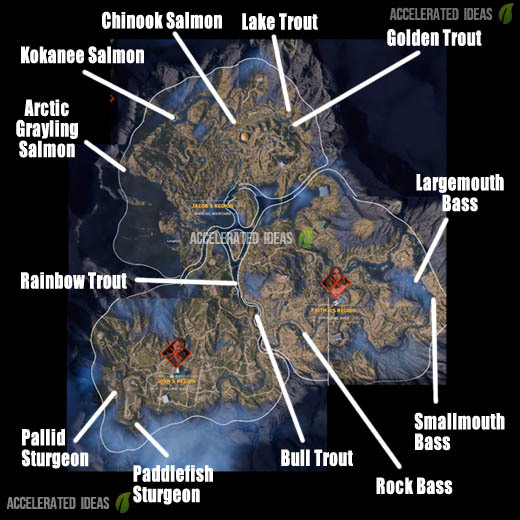 The list below shows each of the Hard Fishing locations on the world map. Remember, you MUST fish in the hard fishing spots, for the particular fish you want to catch, to have any chance of catching a record sized fish and breaking the record. Golden Trout - North east shore of Silver Lake in Jacob's Region. Lake Trout - Far eastern side of Jacob's Region, north of Fort Drubma at Wishbone Lake. Rainbow Trout - Northern side of John's Region at the small lake to the south west of Rae Rae Pumpkin Farm. Pallid Sturgeon - Western side of John's Region, south of Lamb of God Church. Paddlefish Sturgeon - South western corner of John's Region, right in the corner of the world map. Chinook Salmon - Central north side of Jacob's Region, north west from the FANG Centre. Kokanee Salmon - North western side of Jacob's Region, in the south western corner of Cedar Lake. Arctic Grayling Salmon - Far western side of Jacob's Region, venture over the top of the mountainous region to reach the far edge of the map. Smallmouth Bass - Eastern side of Faith's Region, eastern side of the Bass Lake. Largemouth Bass - Just north of the Smallmouth spot above. Rock Bass - On the far north western side of the Bass Lake. Make sure you unlock the "Fisher King" perk (4 points) which unlocks new lures (flies) for catching large fish. Without these lures, you won't catch any big fish. Use the right lure (fly) for the particular fish you want to catch. On PS4, press the triangle button to cycle through the lures before you cast into the water. It takes roughly five minutes to catch a record fish in each of the hard locations. Once again, you must fish at the hard spots to get the weight required to beat the state record.